Something's going on, his voice filled with dread. We're sending a crew, we're waiting for names. He's flying too close, Oh, God! Get away from there! A poisonous arrow aimed at America's heart. This can't be happening, two crashes in an hour? What's going on? Are we under attack? Have they lost their minds? Or were they just off track? This can't be on purpose! Not here, it can't be! Don't they know we're the land of the free? We are America! The people who care! The one's who send aid to lands everywhere! Who would want to hurt those poor innocent souls? How can such evil be someone's goal? Then came the news, another plane, another town. This time it's the Pentagon, have they lost their minds? Dear God, this can't be happening, weren't there any signs? I must find my family, but where do I start? My daughter's in college, we're 500 miles apart! The world's in slow motion, I really can't breathe! Her son works at the Trade Center and lives very near. Dear Lord, what now, where else have they hit? How many will die before the end of it? Flight 93 would fall, killing all aboard that fateful day. 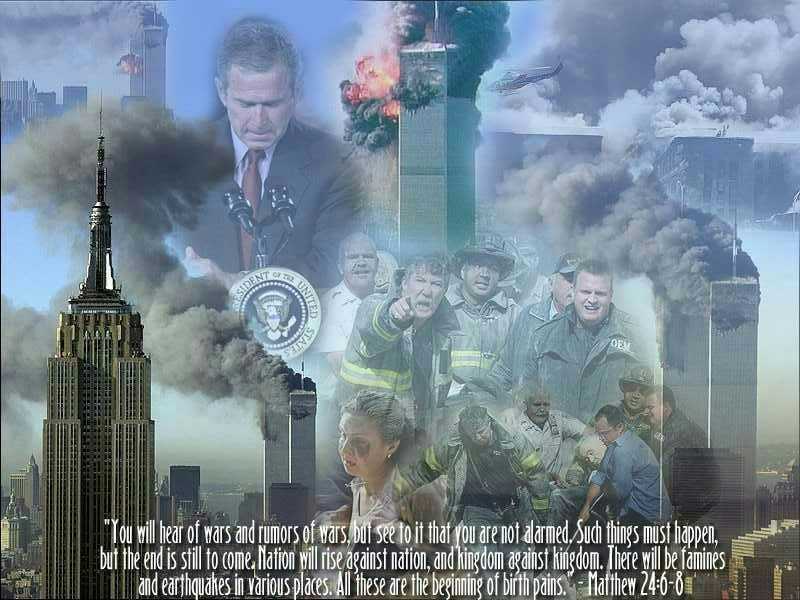 The horror continued, the Towers, they fell. What once had been paradise, now reduced to Hell. But under attack, Americans would unite. We'll get them, we vowed, we're not afraid to fight! Pledging to fight the good fight, to avenge each one who died. But, alas, the fight would bring out America's worst. It's turned into a battle of politics, you see. It's no longer what is right to keep America free. To fight against the terrorists, come what may. I fear that they are winning, we are playing into their hand. United we stand, divided we fall; so the saying goes. And this fight has divided our nation, as the Zogby poll shows. Then the terrorists will win, make no mistakes. This is our undoing, this is how it is done. We must fight to the death, to keep our country free. And sometimes that means doing things that aren't so nice. Just remember who keeps you safe when you turn out your lights. And pray to God that most Americans will agree with me. And we won't see the enemy within until it is much too late.